Upgrading T5720 from flash drive to 15 GB 1.8 mini HDD? How to setup automatic updates with MJ? "Memory could not be read"???? Can I have on my TC - print server and run Team Viewer? Best HP Original XPe Image for a T5700 512/256? What Drivers are need to setup a WYSE 9450XE for MJ ?? Is there an easy way to change computer name? No Need For A Thin Client or a Computer !!! 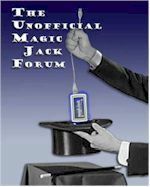 Magicjack useless for incoming calls.